Tired of constant losses during manual trading? Don’t have enough time to sit, watch and analyze your charts? This software might be just for you! Even good technical analysis does not always work the way you expect and market always brings you surprises which almost every time leads you to losses. In our long experience with Forex markets we have noticed that strict rules and mathematics works best. In order to have constant profit in those markets one must understand at least basic laws of probabilities as well as create logic strategy using them. Want to win against this everyday changing market? This software will do the job for you – all automated! Introducing you to Grid EA. We where working hard of developing and testing this exclusive EA. As we gained a lot of success with our last projects which was mainly focused to hedging and breakouts we have developed a lot of experience in special calculations and formulas which leads to even more safe, stable and profitable software. 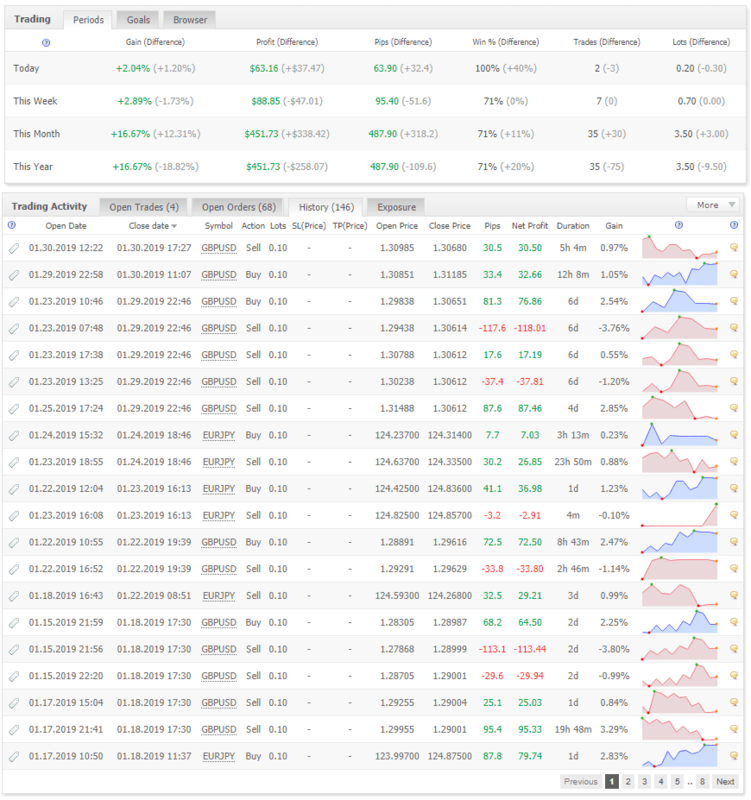 We have made lots of testing and updates to this Grid EA core during last years, so we could offer you most stable and safe release with completely new strategy using Grid Trading system. EA was tested in various market conditions to prove its stability. We have pushed this product to the limit, created some hard situations like unexpected server disconnections, platform shut downs, tested it on news as well as different time frames and Grid EA held just fine with all that. This product will absolutely fit to all new entry level traders as well as all the professionals which uses bigger lot sizes to gain bigger profits. Grid EA is mainly focused on mathematical calculations and probabilities, so it does not care too much about the market trends, news and all other difficulties which often confuses new traders. This Grid EA basically can start trading any time and any pair you wish, the only thing it needs is just moving price and some time, the rest market and EA engine will do. Just leave it on sit back and let the software do its job. Tested and works best with our trusted broker. Deposit here and get your bonus. Also Read our promotions page. As for the testing we have chosen Jpy pairs since it usually moves a lot and we could get some profit faster than with slower pairs. Test was performed on live account using our partners PaxForex broker. Initial balance was as low as $100. We left this final EA release to work on its own for about one month and it gained more than 100% of profit per month using single chart and fixed 0.01 micro lot size. This Grid EA does not use any kind of martingale strategy! Bellow you can see EA performance on live account statement. Software was running every day for one month and it is still running with successful profits (we are updating this information, please follow our social networks to get latest information and updates). What makes Grid EA so special? How does Renko Scalper works? As we all know Hedging strategies requires huge precision and accuracy. This is why EA does it better than human. This Grid EA uses pending orders. At the moment when you start this Grid EA, it will immediately begins placing pending orders across your chart in both directions, so the price will never have a change to escape. You don’t have to worry which side price will move, because you will already have your trades set and ready, waiting for the price action to hit them. Now, main confusing thing about this our unique strategy is that we trade in opposite way. Why? Because it is the only way to gain profit from always chaotic and unpredictable Forex market. It may sound a bit confusing for the first time, but try to read this information carefully and the knowledge about this system should come to you pretty quick. So how it really works? At first Grid EA will put you in the middle of chart/price – creates a channel. It does not care which side market is moving, because it will move sooner or later in upside or downside anyway. Since we don’t know where it will go, we put lets say 15 Sell pending orders to the top side from our current price and 15 Buy orders to the bottom side. Now you have a Grid on your chart full of orders waiting to be executed. You may set, lets say 40 pips space in between those trades (you may change those parameters anyway you like in settings window). 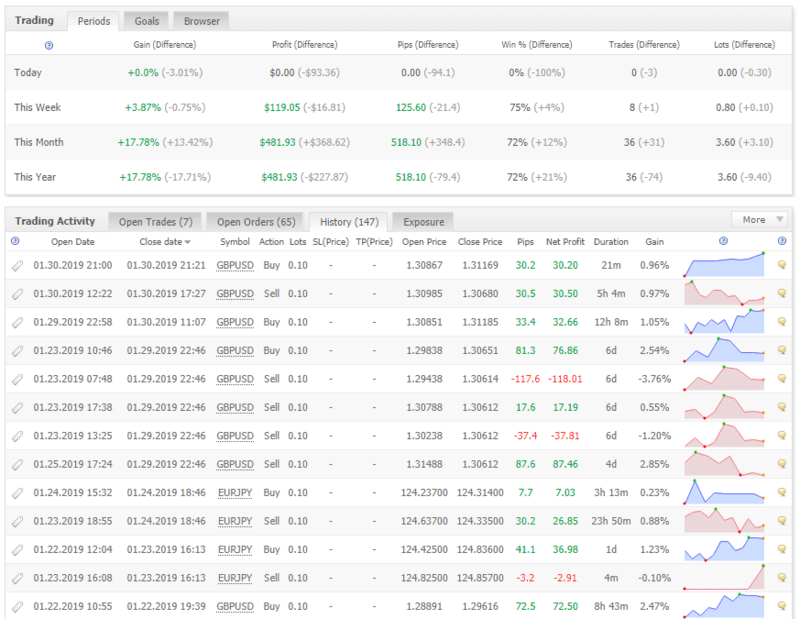 So the trades will be separated with 40 pips size gaps. Now, you must be asking your self how can we gain any profit if we have opposite trades all over the chart? The answer is simple: retracements! Remember market never moves infinitely to one or other side, it will always sooner or latter must have a correction. When it happens market will turn back and all of your opposite positions will became profitable, EA will calculate all of the loss and winning ratio by its self, and when total profit/loss will be the amount that you put in the target field(lets say $100) EA will close all the trades with profit. Now, for safety reasons in case of news or important levels, the first two trades in the starting channel will be to normal side, you will have one Buy if the market goes up and one Sell if market goes down. This way when you will be collecting opposite trades and wait for the retracement, you will always have at least one trade for safety which will balance up your floating loss. Remember, when trading Hedge, EA will always have floating loss, but any bigger movement (which is guarantied to happen) will bring you to profit very fast and safe. There is one more safety feature in this EA, recently discovered by one of our developers. It will add an extra space between each trades, for example: if you put 40 pips to the parameter called spaceBetweenTrades, and 10 pips to next field called extraSpacer, EA will add extra 10 pips space between each trade. 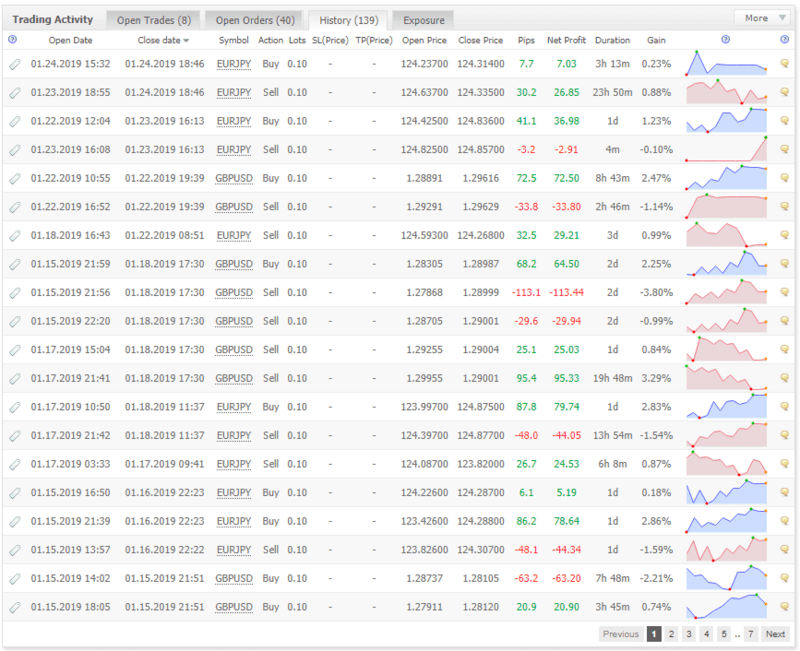 Like: first space will be 40 pips, second 50 pips, third 60 pips and so on… Whats the point? It works like a filter protecting you from any extra unnecessary trades which may occur during the news, some unexpected spikes, etc… This will also save you equity and will use less margin. All of those things will begin to be more clear when you start trading ant watching chart on your own. Click to Download and read the user manual guide for this EA. As for the testing we have chosen JPY pairs since it usually moves more than others and we could get some profit faster. But it is also recommended to use it on low spread pairs such as EUR/USD. Test was performed on live account using our partners PaxForex broker. Initial balance was as low as $89. After one week of live trading we had more than 2 times bigger balance with 0 draw down! Which is about +100%/weekly or ~400% of profit per month. Bellow you can see EA performance on live account statement. Software was running every day and it is still running with successful profits (we are updating this information, please follow our social networks to get latest information and updates). EA will come with same settings used for our live test by default. Tested and works best with our trusted broker. Deposit here, get your bonus, and get this EA Free from us! Read our promotions page. With version v3.1 we have improved this Grid EA and added parameter called entryMode. For those who are uncomfortable using EA against the trend, now you will be able to reverse the EA trading process in anyway you like. For example, if you use entryMode=1 EA will trade against the market by putting Buy orders in bottom and Sell orders in top side. If you use entryMode=2 EA will trade with the trend, buy putting Buy orders in top side and Sell orders in bottom side. This might be very useful option to have. Why? The answer is that different pairs act differently. Some are more chaotic, some are more stable and reacts much better to the trend. For example EUR/USD pair has lowest spread, but it is very unstable, unpredictable and chaotic, market likes to check its support and resistant levels and sometimes more then once, this is why for such pair would be wise to use entryMode=1. If we take a look at pair let say GBP/JPY, it looks that it moves more smoothly, also it has much bigger moving volume then other pairs. Also this pair usually has bigger spread, so it means that trades are more expensive, but lets say thats the penalty of this pair predictability. To wrap it up, this function is very usefully for any user trading style, lets user choose trading style according to market movements, its better for pairs who moves in big volumes in short period of time. 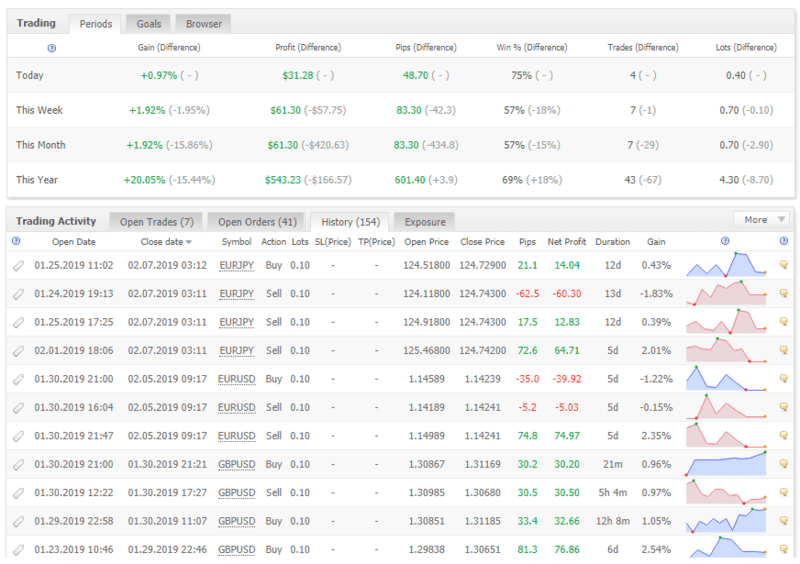 In version 3.1 we have also added CalculateSwap function, sometime you will have long time orders for few days, it is good idea to calculate all the swap you had during that time. So this might be very useful tool to achieve even bigger and faster profits. This version includes LotAdd parameter. You can use this if you want to get your profits faster by increasing Lot size with each pending order. For example: this means that if you put 0.01 in LotAdd field your first trade above or below your channel will be 0.01, second 0.02, third 0.03 and so on… This way you will get more trading power when the market is not moving very much. Warning! This might be harmful for smaller balance accounts, please calculate the values according to your account size and use it on your own risk. In order to switch this function off, simply put 0 in this field, EA will use fixed lot size for all orders. Added reverseCenter option. This way it is possible to choose reverse or not the first two trades in the center channel. This is a very big update for this EA. It comes with completely new user interface which allows users to control trading process even more easily with just single button clicks. 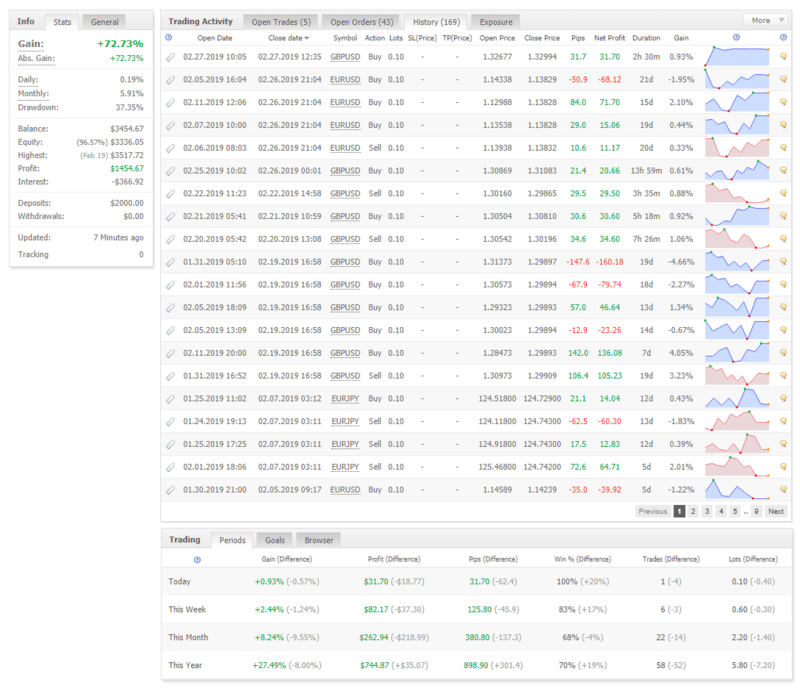 You can close, open and manage your trades directly from the chart now. Also there is a new window with special trend calculations for each time-frame so it is easier to make decision on settings or get common sense about the pair trend. From now on it is possible to rent the EA for various period of time (pay as much as you use it). You can add or remove accounts to your license. Installation process is very easy as well, setup file will be provided. Many safety bugs has been also fixed, so EA is even more safer now. Note: for all users who already own older versions, new versions is free! You can get the updated files by logging in to your account and re-downloading them from your dashboard. Start earning profit at the professional level. Get your own copy of: Grid EA. Robot is already adjusted in best settings, so you can use it on default settings, or change it by your own needs. The package contains easy setup file which will automatically install and set all needed components for your MetaTrader4 platform. You will be able to use your EA within a minutes as soon as you make a purchase! Click here if You need the instructions of how to download and install a product? - Stick with the trend!